Hi!!! I come brining peanut buttery gifts of Peanut Butter Banana Overnight Oats that is. If you are a peanut butter lover this recipe is for you. From peanut butter powder, the drizzly creamy stuff and chopped peanuts this breakfast is a nutty-over-PB-fanatic’s dream. If you’re trying to simplify your life, overnight oats is the way to go. 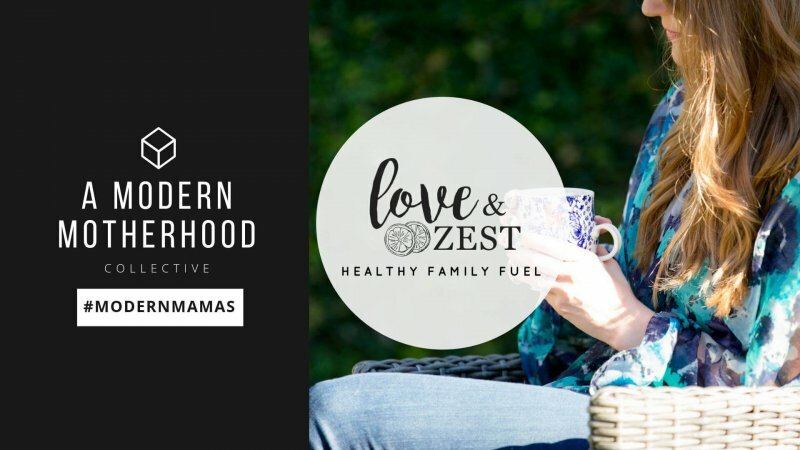 When I need breakfast in a hurry without the mess of dishes and kitchen clean up and time spent preparing a breakfast meal… [and let’s be honest, that’s nearly every weekday morning], I turn to overnight oats. 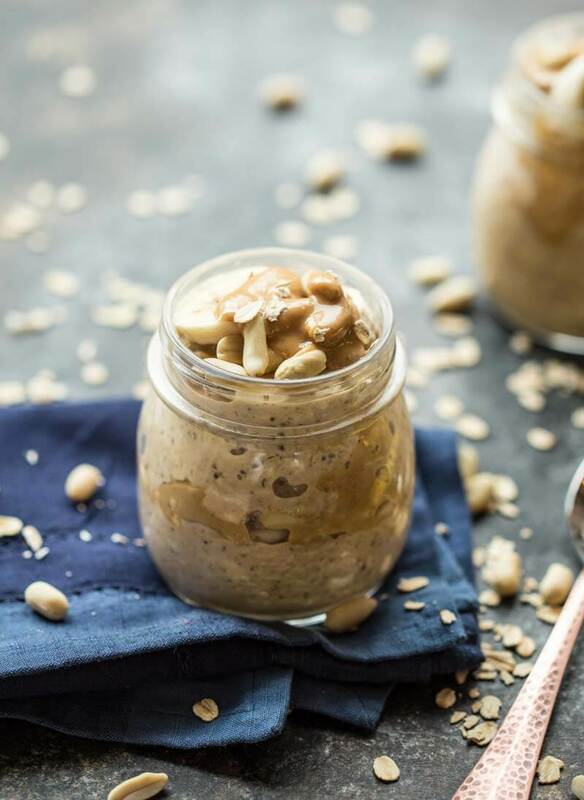 All you have to do is add oats, chia and coconut milk to a mason jar (or bowl) with peanut butter (DUH)…cap it and give it a shake (or stir if you’re using a bowl), and refrigerate. They are usually ready in about 4 hours, but more conveniently if chilled overnight for a grab and go breakfast solution. And Peanut Butter Overnight Oats are on point. 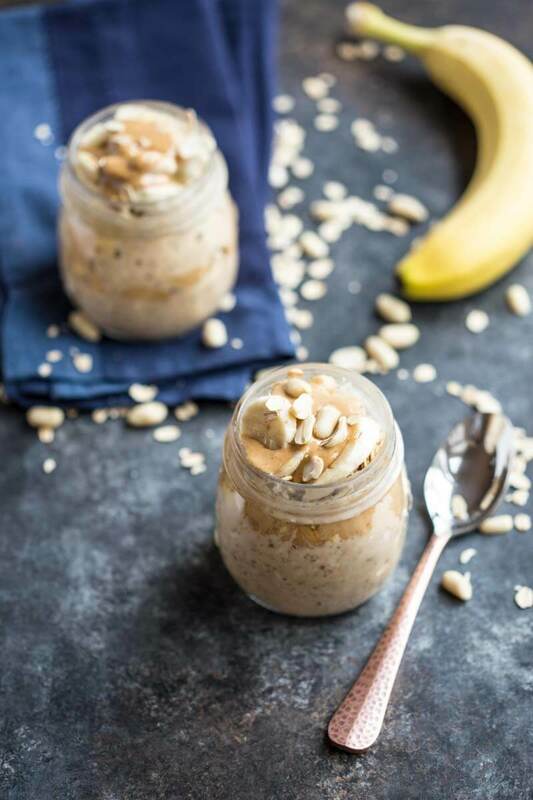 Peanut Butter Banana Overnight Oats…. a no sugar added and dairy free meal prep that makes a tasty and satisfying and peanut buttery breakfast!! 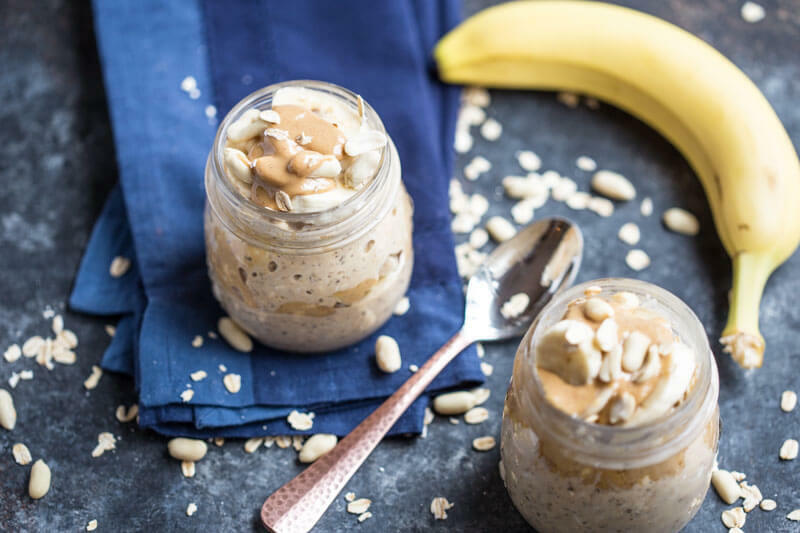 Peanut Butter Banana Overnight Oats…. this no sugar added and dairy free meal prep makes a tasty and satisfying and peanut buttery breakfast!! In a medium bowl, stir together powdered peanut butter, oats, chia seeds, coconut milk, and vanilla extract. Divide evenly into mason jars or storage containers and refrigerate overnight. Before serving to each with banana slices, chopped peanuts and a drizzle of peanut butter. 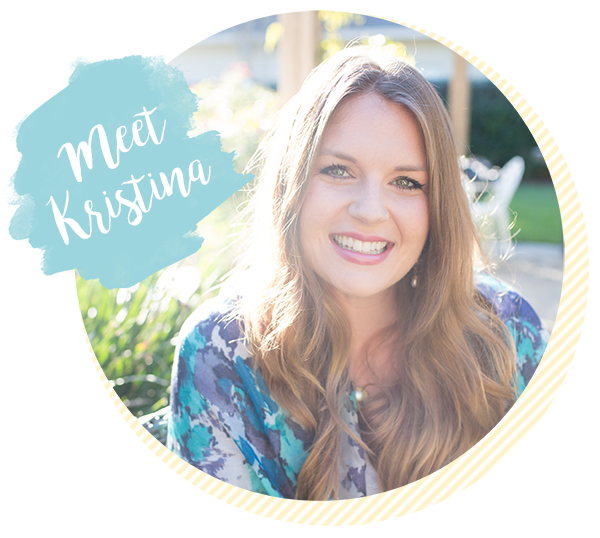 have you heard of PB2 or PB fit? It’s defatted peanut butter powder or peanut butter flour. Basically ground peanuts but in flour form. Honestly you can probably just leave it out and reduce the milk to 1 or 1 1/4 cups or simply just do a cup of oats instead of 3/4 oats. What size jar should you use? Started following you on Insta as I loved your pics. These overnight oats look delish. My SIL has been asking me to make something with oats and looks like this is what I will make for her. Thanks for this recipe. Yuuuuuuuummm!! Love the pb powder addition! 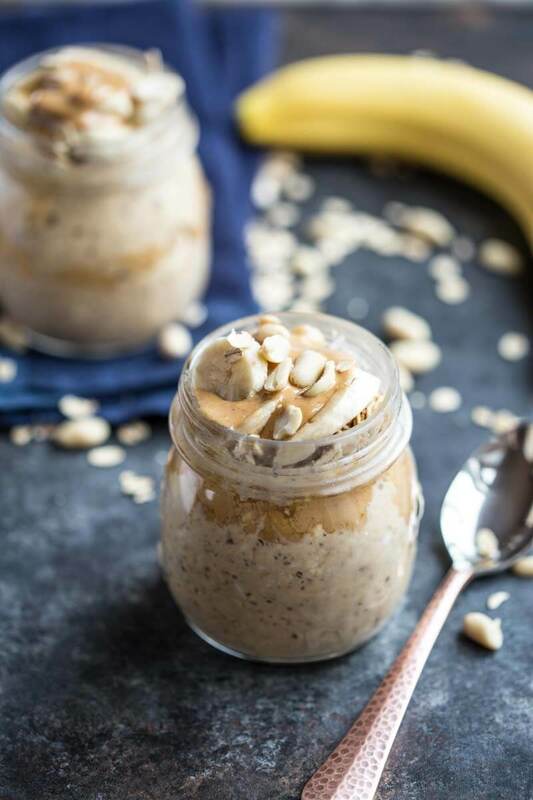 My all-time favorite breakfast flavor/ingredient combo–peanut butter and banana! I’m printing this recipe now so I can bring it to my kitchen to make ASAP. Nothing beans peanuts and bananas combo! Thank for a great recipe! I loooove ONO! And the more peanut butter the better! This looks amazing! I am obsessed with peanut butter and I like the idea of using a good powdered one since I tend to pile it on. : X Love it! I love peanut butter and banana as a combo! This looks delicious! My favorite combo is Nutella and granola mixed in my overnight oats! I’ve been dying to try overnight oats. My husband loves peanuts and I am a banana fiend. I have everything to make this except the chia seeds. Adding to my shopping list now! 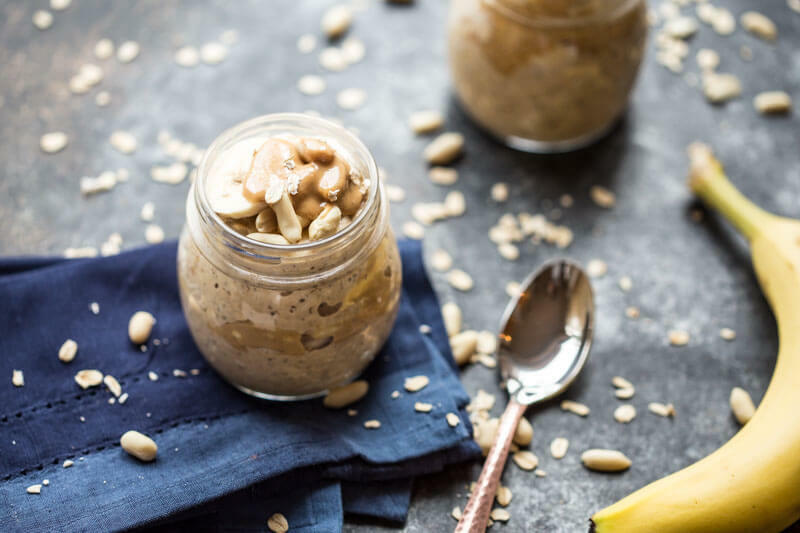 I love overnight oats and this combination of peanut butter and banana is perfect. Deliciously simple – this recipe is a must to have on standby for busy weekdays. This looks delicious! I like how filling this is. 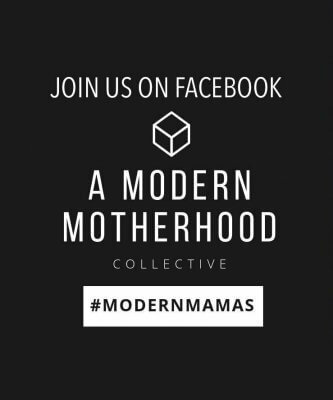 Great breakfast option!